At Davis Floral, we are committed to offering the finest floral products & gifts, backed with service that is fast, friendly and 100% reliable. We offer a wide variety of fresh flowers, silk and dried arrangements, helium balloons and gift items that include Willow Tree collectibles and Yankee Candles! Looking for Something Special? Call us toll-free at 800-597-3199. We'll find the perfect way to help you send your "Floral Gift With Style!" 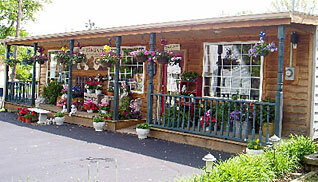 Our store hours are Monday through Friday, 9am to 5pm and Saturday from 9am to 12pm. We are closed on Sunday. We make each fruit and snack food basket to order. Using the freshest fruit, teas and coffees, cheeses, crackers and assorted sausages, ham and roast beef. We can also add some Ghirardelli Chocolates for those Chocolate lovers! As always, freshness is guaranteed. Just minutes from Hendricks Community Hospital. We make deliveries to Hendricks Community Hospital several time per day. If you don't know a patient's room number, we'll get it for you and if they have been dismissed, we can deliver it the their home. We also deliver to all other medical buildings, as well as, area nursing homes.